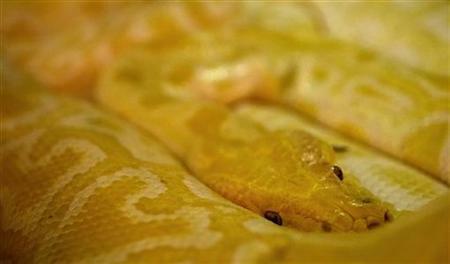 (CBS/AP) A Kansas woman was lucky to escape relatively unscathed when her pet python grabbed onto her neck, and wouldn't let go until a police officer intervened. She did not escape the clutches of the law, however; Chrystal Wilson of Lyons, Kan. is charged with harboring a vicious animal, according to the Reuters News Service. Lyons Police Chief Chris Detmer says the incident occurred this week when the woman pulled the snake from its cage to feed it. The reptile grabbed her neck and latched on. Her children called 911. The Hutchinson News reports that Officer Max Bryant responded to the call. He took the snake by its snout and lower jaw and forced its mouth open, freeing the woman. Chief Detmer said the snake owner was treated for scratches to her neck. Wilson was ordered to remove the snake from her home because it poses a risk to children there, along with receiving a misdemeanor citation for harboring the python, Reuters reported. The snake was taken in by a friend of Wilson's who doesn't have children. Officer Bryant will receive a citation for his bravery.